Matt McClure, Executive Chef of The Hive at 21c Museum Hotel Bentonville. The Hive represents James Beard Award Nominee and Arkansas native chef Matthew McClure’s take on the “High South” – his home state’s distinct culinary identity—in dishes like Sorghum-Roasted Duck with hominy grits and a wood-fired Hog Chop with Ralston Rice. McClure was born and raised in Little Rock, Arkansas, where hunting, fishing, and his grandmother’s cooking ignited his passion for food. In 2012, he joined the opening team of The Hive. 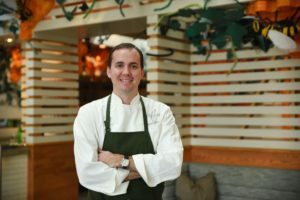 A James Beard Award semifinalist for the “Best Chef: South” category consecutively from 2014 to 2018, McClure is also an active member of the Southern Foodways Alliance.